I purchased a pack of forty curlformers. The packaging suggests that the curlformers are for long hair and a Shirley Temple curl versus a mermaid wave. 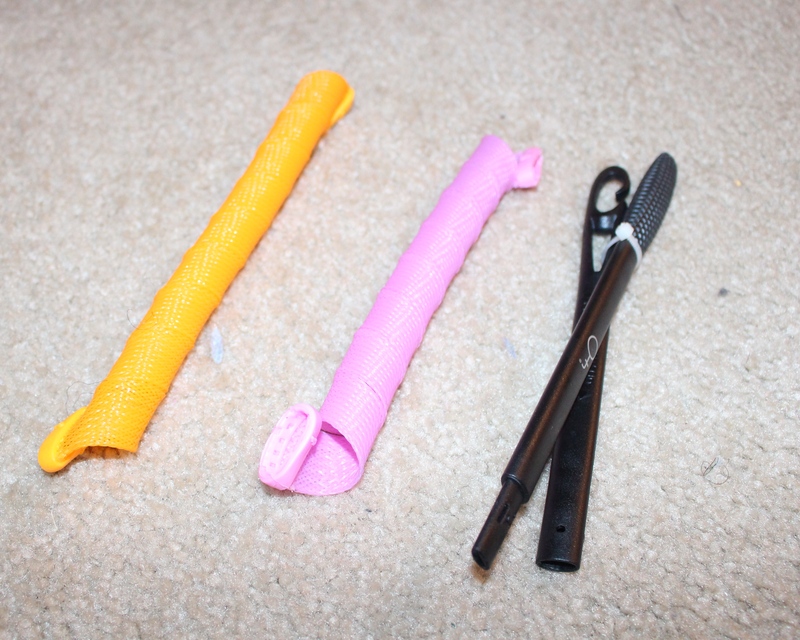 It came with two colors, pink and yellow, which helps the user to distinguish between the direction the curl will fall and a stick that you use to thread your hair into each curl former. 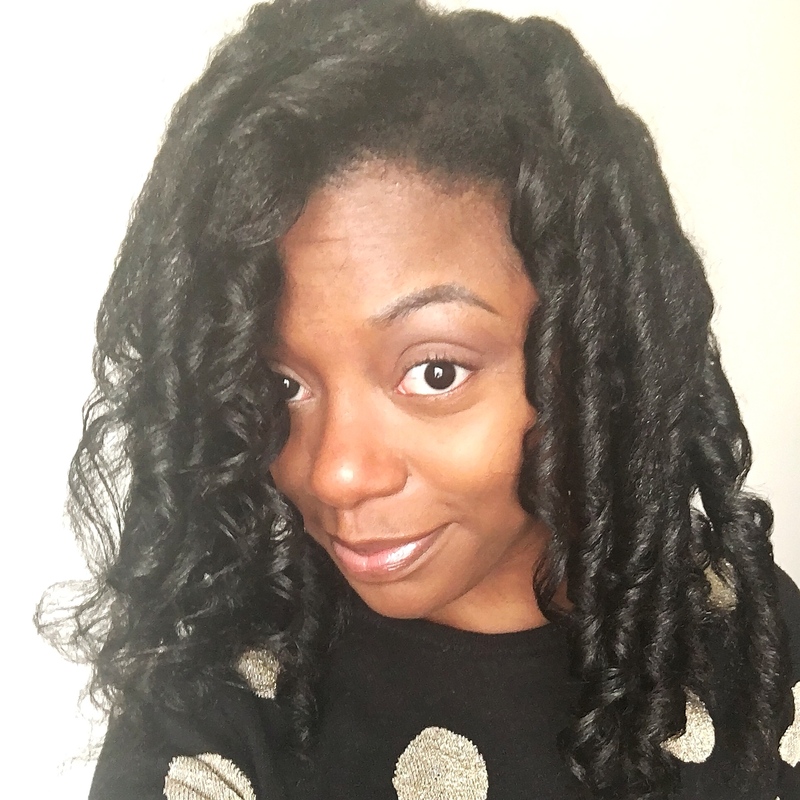 I chose to try the curlformers on hair that was already stretched from a bun I had been wearing all week. I separated the hair into four sections and got right to work starting from the nape of my neck and working my way to my forehead. I would have provided pictures I had a rather hard time in the mirror trying to figure out how to get my thick hair through each curlformer. To prepare the hair for each curlformer I first dampened the hair with water. Next, I took a soft bristle brush and passed it over each section to smooth it out. 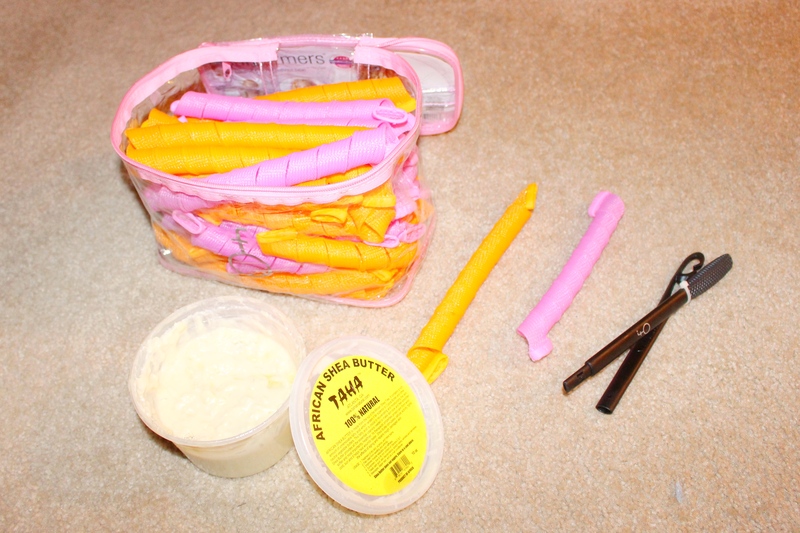 As a styling creme I stuck with my handy-dandy Shea Butter mix. Once all forty curlformers were in my head and all energy was depleted from my body, I crawled into bed for some rest. You may be wondering “uhmb. How in the world did you sleep with all those things in your head?” Well I’ve got two words for you. Very uncomfortably. The pro was that sleeping in the curlformers over night allowed for plenty of drying time! I loved the results the curlformers gave me! The curls were bouncy, soft and best of all required no heat to achieve! Hooooowwwever, after a day some of my curls began to frizz forcing me to resort to a half up half down hairdo that night which then turned into a ponytail of curls by Wednesday. My guess is that next time I will need to use a bit of gel or styling mouse in order to get the style to last longer. Do you think you’ll give them a try? Or have you already tried them? I’d love to know about your experience with this hair styling tool! Thanks as always for your visit and don’t forget to subscribe! If you liked the post share it with someone else via twitter or facebook! P.S. *deep sigh* I am in the process of trying to record a video on how I make my shea butter mix. This will be my first hair video and I’m not completely sure its worth posting. In other words it’s not going to be the best hair video you’ve ever seen lol. Pray saints lol hopefully I’ll gather the courage to upload it soon! Your first go at it was great! I remembered a lady that used setting spray for her curls and they came out nicely. I think humidity was the enemy in your case though as far as frizz was concerned. Can’t wait to see your video! Until then!